Junior Adam Pohlman looks past a Lincoln defender for a teammate to pass the ball to during the Feb. 10 game against Lincoln University of Missouri. 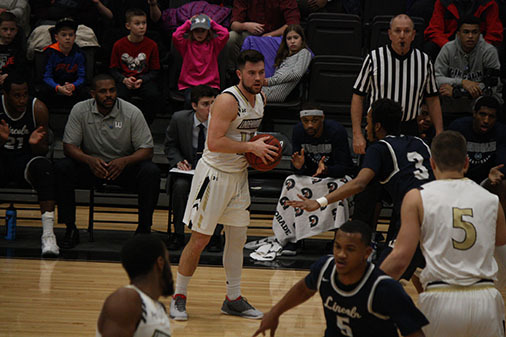 Lindenwood men’s basketball (14-11) fell 79-64 in its final road game of the regular season at Lincoln (14-11). Lincoln made it two wins in a row as it also defeated the Lions 67-64 at Hyland Arena on Sunday. Last year Lindenwood swept Lincoln in the regular season before falling to the Blue Tigers in the first round of the MIAA Conference Tournament. Junior forward Drew Moore earned his first start of the year in the contest. Moore finished with three points and seven rebounds. Three of the other four starters finished in double digits. Junior guard Brad Newman finished with a team high of 19 points, Newman averaged 16 points per game in the two games versus Lincoln. Junior forward Chandler Diekvoss finished with 15 points. Diekvoss has scored in double digits in four of the last five games. Junior guard Adam Pohlman finished with 10 points and sophomore forward Dominique Dobbs finished with nine points. In the first half, Lindenwood’s offense struggled against Lincoln’s man-to-man defense. It shot 34 percent (8-23) from the field and trailed 35-22 at the half. The second half started well for Lindenwood as the team went on an 8-3 run to open up the half and cut the lead to 38-30. The entire second half was a game of runs for both teams. Lindenwood cut it to within seven points on two separate occasions and the Blue Tigers came back with a 3-pointer on the following possession. The Blue Tigers’ junior guard, Amariontez Ivory, scored 20+ points in both games against Lindenwood and played for over 36 minutes in both games as well, according to Lindenwood Athletics.